After falling in six out of seven quarters from mid-2014 to mid-2016, coal production rose in the third and fourth quarters of 2016. Among the coal supply regions, the Powder River Basin in Montana and Wyoming saw the largest increases in the second half of 2016. The increases in coal production were driven by an increase in coal-fired electricity generation, which occurred as natural gas prices increased. Electricity generation accounts for more than 90% of domestic coal use. During the third quarter of 2016, warmer-than-normal temperatures led to increased electricity generation—the highest on record for those three months combined—which resulted in higher consumption of coal compared to the first half of 2016. In the fourth quarter, even as electricity generation declined, because natural gas prices remained higher than in previous quarters, the natural gas share of electricity generation fell and coal consumption increased slightly. During December, the coal share of monthly electricity generation surpassed that of natural gas for the first time since January 2016. 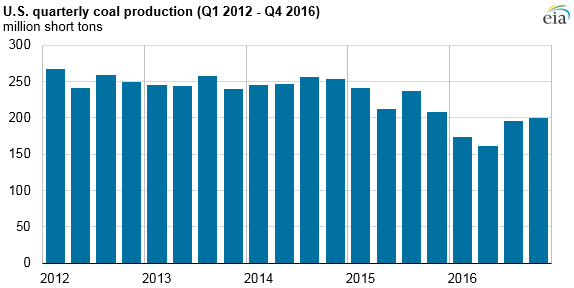 Regionally, production from the Powder River Basin (PRB) increased the most from the first half of 2016 to the second half of 2016. Coal production from other regions, including the Appalachian and Illinois basins, remained relatively flat. Increased demand for Power River Basin coal was not limited to any geographic region. Almost all of the 29 states that received PRB coal previously increased their consumption during the second half of 2016. Among those states, Texas, Illinois, Missouri, and Wisconsin collectively accounted for approximately half of the total increase in PRB coal demand.